First I am happy to report I graduated from an intensive 3-week long, 200-hour yoga teacher training on Saturday. It was an amazing, exhilarating experience. I have appreciated your good wishes and encouragement the past few weeks and am looking forward to catching up on your blog posts soon. There has been little time to reconnect with my garden but stepping out to gather items for this week’s vase, I noticed suddenly lantana, buddleia and phlox are in flower along with monarda, echinacea and shasta daisies. From among these I picked Phlox paniculata to share today. In seeking companions for the phlox, I abandoned my usual restraint, including a mix of whatever flowers said hello as I walked through the borders. The result is an untamed garden variety of shapes, sizes and colors. The flowers were left unarranged in a water glass just as they were placed when I collected them. 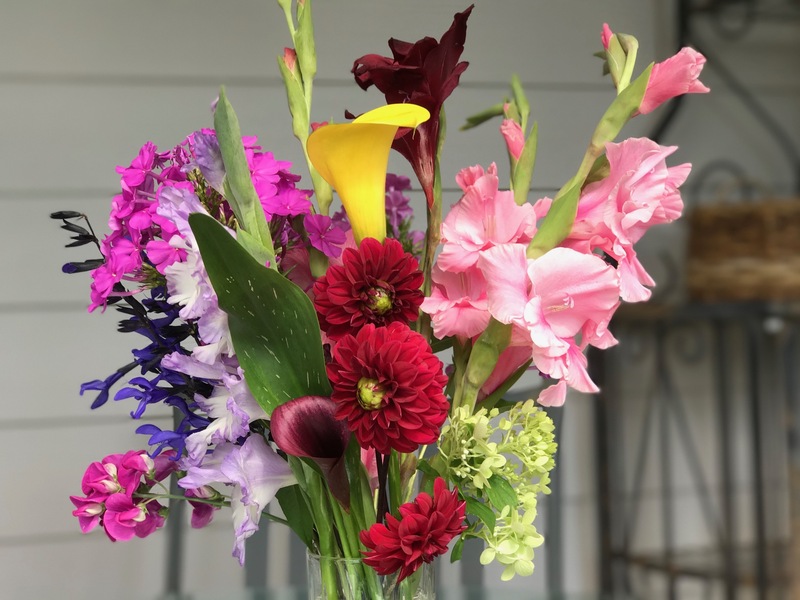 This entry was posted in garden and tagged 2017vase, flower arranging, flower design, gladiolus, in a vase on monday, nature photography, Phlox paniculata (Garden Phlox) on June 19, 2017 by pbmgarden. I love clashy summer colours – but my own garden is pretty monotone – white, green bits of lavender. Summer seems like a time when it’s ok to indulge in more unrestrained color, but I would enjoy your garden. That palette sounds sounds beautiful and calming. It’s been really hot the past couple of weeks but we finally got rain to refresh the garden. When you visited it was 100F. during a drought. I was at Duke Gardens a month ago for a very brief stop. It was 90F., extremely humid, and I wondered how you, R., and I managed that day! So grateful to know you. An exuberant display of garden love! ❤ Congrats on your completing your training. Where do you go from here, what's your dream? Thanks Eliza. Initially I hadn’t planned to teach but now I hope to do just that. And of course, I want to keep studying. Never-ending practice, that’s what I love about yoga. I’m planning on being a very old granny practitioner! Congrats on passing and congrats on a stunning grouping of blooms! Thanks Cathy, I am sure to work my way back to spare floral designs, but it was nice to just showcase a floral abundance today. The yoga experience was exhilarating and I am so grateful for the chance. Congratulations on completing your course, Susie! 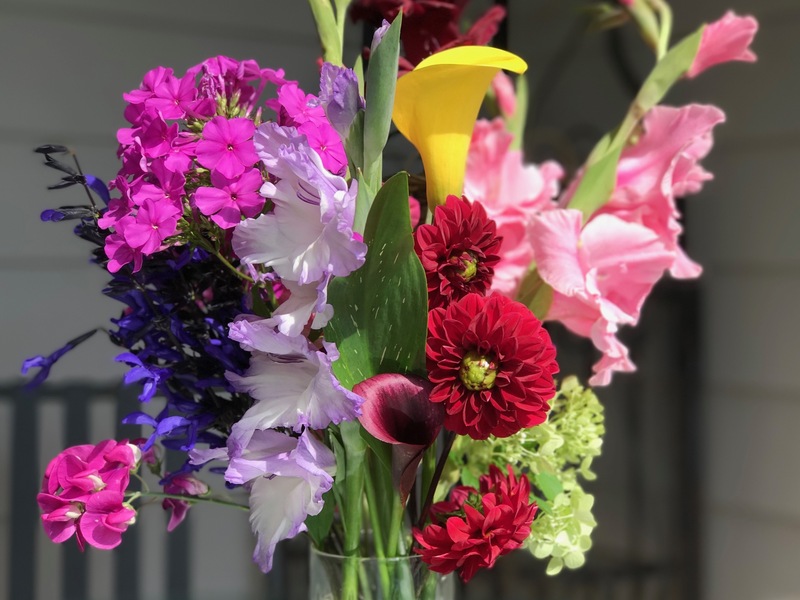 I enjoyed seeing the wide mix of blooms in today’s vase – your garden is celebrating summer! I look forward to meeting you in person later this week. Thanks for the good wishes about the yoga class. It was very special. The flowers have enjoyed a lot of rain this winter and spring. Weather here is definitely summery and hot now. It was dry for about a week or 10 days, but now we’re getting some rains every few days. Excited to meet you soon! Adore this garden mix..sings happiness! Oh, Donna, nice to hear from you, and with a lovely comment! I love a good plonk or plop arrangement and yours is just beautiful. Very cottagey. Congratulations on completing your yoga course. Thanks, it’s nice to have an abundance of blooms right now. The yoga training was great, hard work, but rewarding. Not restrained at all but colourful and joyful. Summer has always been a wonderful carefree time so perhaps that why I was ready to relax with this bouquet. Such an abundance of flowers. Congratulations on your yoga class. Thanks for the good wishes. Summer rains are keeping the flowers gently watered so the garden feels luxurious for now. This is so different to your usual vases Susie, but I love it! It is full of joy and shows me what is flowering in your garden and is so celebratory too – well done on the yoga trainer course. 🙂 Will you start your own group now? Cathy, I think you’re right about this vase being celebratory. No holding back this week! Right away I plan to teach a few friends who have volunteered to practice with me, then we’ll see. Do you practice yoga? I have never tried yoga Susie, although I know the benefits would be good for my body and mind. I think it is the idea of being in a group that puts me off. I had classes in oriental dance for many years and once had a dancing holiday where meditation was included… I couldn’t switch off surrounded by other people! I remember feeling the same way about being in a group when starting yoga. Felt somewhat vulnerable. And that’s the challenge of meditation. Our minds keep working, thoughts keep coming–looks easy but it’s hard. Gardening is very meditative for me. Same here. The best way for me to switch off or contemplate. I always feel physically tired but mentally refreshed after a day outdoors! Exactly so Brian. Fun to have a bit of riotous color. How well your garden grows! Congrats on your graduation too! Well done on passing your course…and well done on your garden for coming up with such a summery collection of blooms…praise for the gardener too. Thank you Noelle. I appreciate your good wishes. Contained exuberance could explain this happy vase as well as the practice of yoga. I think you’re on to something. It’s fun to enjoy a bit of frivolous color in a vase once in a while.